Great proximity to all Central Florida has to offer, with the added bonus of beach access. Get all of this and more with a timeshare at Holiday Inn Club Vacations Cape Canaveral Beach Resort. And when you buy or rent through SellMyTimeshareNow.com, you'll uncover huge savings—up to 70% off. What’s My Cape Canaveral Beach Resort Timeshare Worth? 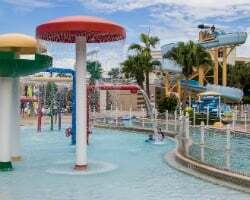 Formerly known as the Ron Jon Cape Caribe Resort, Cape Canaveral Beach Resort provides a fantastic ocean escape for people of all ages. 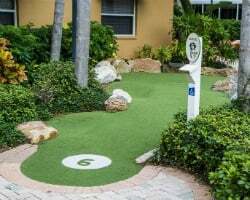 The resort grounds are chalk full of great activities including a mini golf course, lazy river, movie theater, and a four-story waterslide. You can also walk down a private boardwalk path to oceanfront access and watch the cruise ships go by. Enjoy all of this while still easily being able to take a day trip to the Magic Kingdom, Epcot, or any of those fantastic Disney theme parks. No matter the size of your family, Cape Canaveral Beach Resort has the units to accommodate you all comfortably. Studio, one-, and two-bedroom villas are available with great amenities and a patio or balcony to enjoy a cool ocean breeze. Many villas offer ocean or pool views for you to enjoy. Sound like the Florida escape you've been dreaming of? Fill out the form on the right of this page to get more information, or call us directly at 1-877-815-4227 and one of our independent timeshare resale specialists will be happy to answer any and all questions you have. Buying a Cape Canaveral Beach Resort timeshare resale ensures you will save thousands of dollars and still enjoy all the luxurious amenities and benefits of any other timeshare owner. 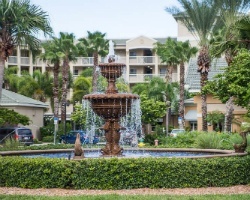 Cape Canaveral Beach Resort is affiliated with Holiday Inn Club Vacations, a well-known brand that is committed to providing the best hospitality and accommodations to all of their owners. When browsing through our inventory, you will be able to choose a deeded fixed or floating week with annual or biennial usage. Seasons include Red, Silver, Gold, Gold Holiday, and Platinum. 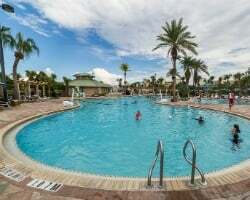 Holiday Inn Club Vacations Cape Canaveral Beach Resort is an incredible property to own at with amazing opportunities for new and exciting vacationing options. While you will purchase a fixed or floating week, each timeshare is assigned a certain points value. Unfortunately, when you buy a Cape Canaveral Beach Resort timeshare resale, you will have to purchase the additional points-based membership to be able to internally exchange within the Holiday Inn Club Vacations collection of resorts. However, once purchased, you can use your points for stays and benefits at any of the brand's resorts as well as other InterContinental Hotels Group destinations, including Kimpton Hotels, Crowne Plaza Resorts, and Even Hotels. You can also accrue IHG Rewards Club points during your vacations, and exchange your Holiday Inn Club points for more IHG Rewards Club points. Cape Canaveral Beach Resort is affiliated with leading external exchange company, RCI for even more exchange options. As an RCI Gold Crown rated resort, you will enjoy a very high trading power. To exchange your week, you will convert your timeshare points value into RCI points and use them vacation at one of RCI's thousands of affiliated resort properties. This can be achieved by purchasing an affordable RCI yearly membership. Holiday Inn Club Vacations Cape Canaveral Beach Resort is a destination packed with activities and attractions for all ages and interests. At the resort alone, you can walk down to the beach and enjoy watersports, grab a bite poolside at the Surf Grill, and float along for a relaxing day in the lazy river. Just minutes away, you can visit the area's famous Kennedy Space Center, shop at The Cove harbor side market area, and watch the ships while you fish at Jetty Park. Cocoa Beach, Florida is also just a short 20 minute drive south! Already Own at Cape Canaveral Beach Resort?